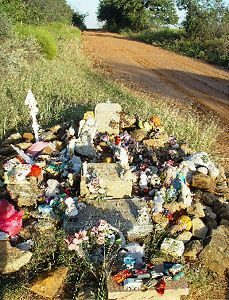 On a lonely stretch of road in north central Texas, a group of faded, tattered toys stand guard at the final resting place of a small child. 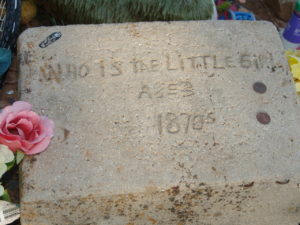 Although the grave has occupied the space for more than 140 years, the toys are more recent additions. But it doesn’t take long for the Texas wind and sun to make things look old. There’s no denying it’s a macabre sight on first approach. 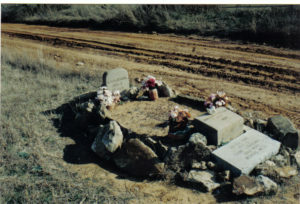 Known locally as The Penny Grave—(people often place coins on the markers) this burial site lies within a few feet of a rural Comanche County Road. According to area historians, the little girl and her family were traveling west with a wagon train. The child supposedly fell off the back of the wagon and died from head injuries. Her grief-stricken family—miles from home—buried the child there before moving on. A cemetery was established at nearby Sipe Springs (pronounced Seep Springs) not long afterwards, but the grave was never relocated. No one knows for sure where her family eventually settled. The first headstone was damaged many years ago, but local residents have replaced it, several times. One elderly woman recalled her mother “tending” the grave for years. (As you can see from the photos, there’ve been three markers at times). Among the things placed on the grave recently were stuffed animals, dolls, baby bottles, keys, angels, toy trucks and cars, notes, photos and Bibles. It doesn’t take long for the elements to mar the items, creating a somewhat garish, but still haunting image. 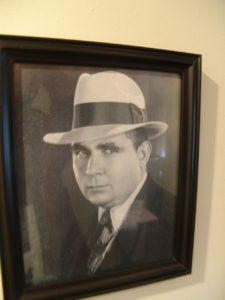 AUTHOR’S NOTE: I took all the pictures shown here, but they were taken years apart. As you can see, the road has been improved during that time, while the grave looks worse. The last time I visited, someone had left trash behind. I truly don’t understand that at all. ABOUT SIPE SPRINGS. 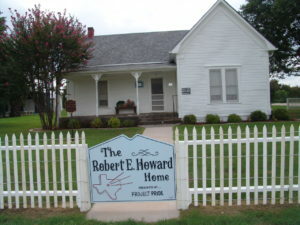 According to area historians, and the book “Patchwork of Memories,” the first school was built in 1873. Churches and a post office soon followed. 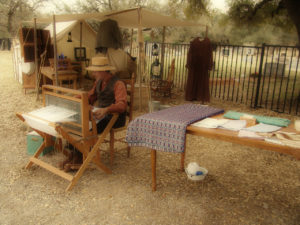 The first postmaster was M.W. 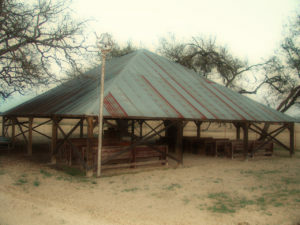 Hall, and several men took turns carrying the mail from Comanche once a week. Later, 10-year-old Nim Childress became the first official mail carrier, riding a mule named Jude. At one point, a company of “Minute Men” was organized for protection from the Indians. One of the settlers, Bob Leslie, was killed during the last recorded Indian raid in 1874. In the winter of 1918, an oil well, the Goss #1, came in and changed the little community. 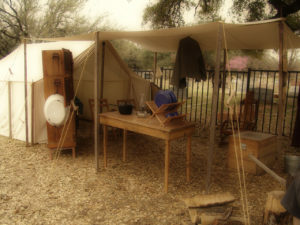 Sipe Springs became an oil boom town. For the next several years, life was good. There were two banks, a big school, an opera house, numerous stores and restaurants, and a professional baseball team. In fact, Sipe Springs grew so fast (the estimated population at one point was around 10,000) that it soon rivaled the county seat, Comanche. That was many years ago. Nowadays, it more closely resembles the cactus and mesquite tree dotted landscape of the 1870s, than it does a bustling town. There are a handful of houses left, and a small but dedicated volunteer fire department. GRAVESITE OF DAVY CROCKETT’S WIDOW. 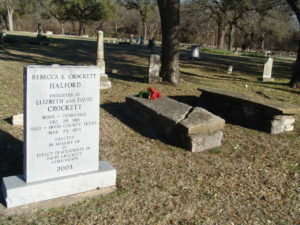 On a trip to Hood County I stopped by the Acton Cemetery and took a few photos of the gravesite of Davy Crockett’s widow, Elizabeth Crockett. Elizabeth was born in Buncomb County, North Carolina in May of 1788. She was Crockett’s second wife. They married in Lawrence County, Tennessee in 1815, after his first wife, Polly, died earlier that year. Two of Elizabeth and Davy’s children are also buried at Acton. 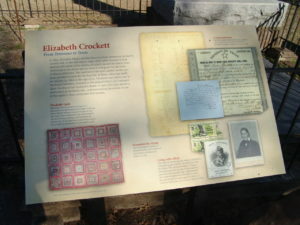 Elizabeth Crockett moved to the Acton/Granbury area in the mid-1850s to claim a land grant for the heirs of Alamo defenders. 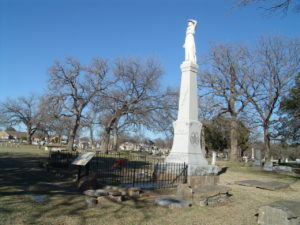 She died January 31, 1860, at the age 72. 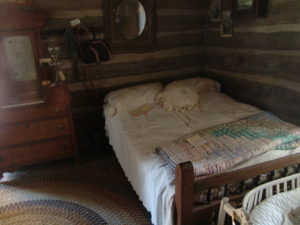 According to historians, Elizabeth had gone for a walk that morning and fell dead not far from the log cabin (built by her son) that she’d called home for the last few years of her life. She was buried wearing “widow’s black,” the color she’d worn since learning of her husband’s death. 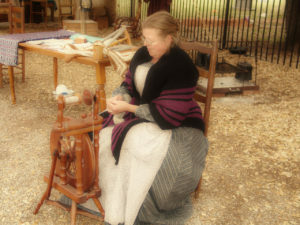 Of course, everyone knows that her husband died in March of 1836, while defending the Alamo—a battle much on the mind of Texans this time of year. 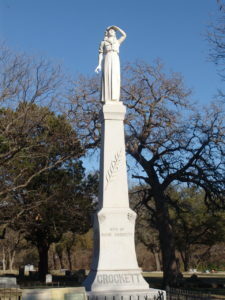 In 1911, the state approved a towering monument (depicting a woman scanning the horizon in search of her husband) for Elizabeth’s grave. In 1949, control of the site was transferred to the State Parks Board, now the Parks and Wildlife Department. 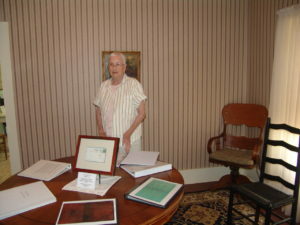 At only .01 acres, Elizabeth Crockett’s gravesite, also known as Acton State Historical Park, is officially the smallest state park in Texas. For years I’ve listened to older friends and family members talking about “tabernacle revivals” and “brush arbor meetings.” Both fascinated me. 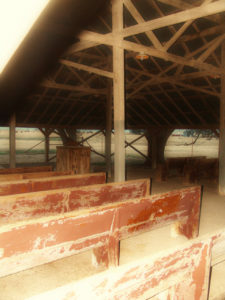 I’ve attended a funeral service in a tabernacle, but never a revival. 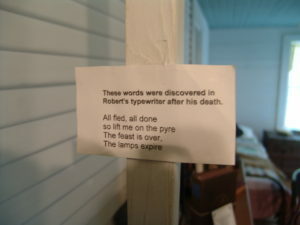 I decided to include one such service in a book I’m writing. Since there are still plenty of the old tabernacle type structures in my neck of the woods I ventured out of my writing cave to photograph two of them for research. One’s next to a church, the other is next to a cemetery. It wasn’t hard to lose myself in the moment as I worked—I could imagine the hymns, the heat, the old-style clothing, even the old-style preaching. As a writer, I have to be able to create “memories” I never actually experienced. I’m grateful every day for the opportunity to do that. Hope you like the photos. A beautiful 1941 Packard on display at the Terrill Antique Car Museum in De Leon, Texas. 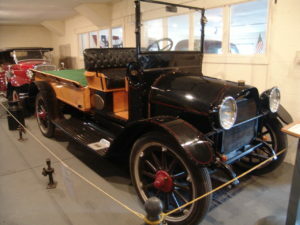 A 1915 REO Speedwagon – 3/4 ton, 4-cylinder, 25 horsepower, 127 inch wheel base – on display at the Terrill Antique Car Museum. 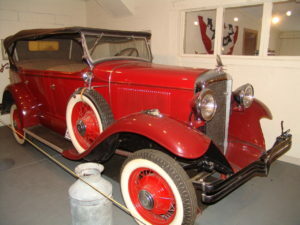 A 1929 Model A Ford Roadster with rumble seat. 4 cylinder, 40 HP motor, 3-speed transmission, 4 wheel mechanical brakes. 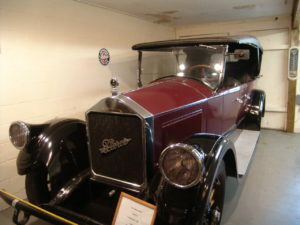 Terrill Antique Car Museum. 1931 Studebaker. 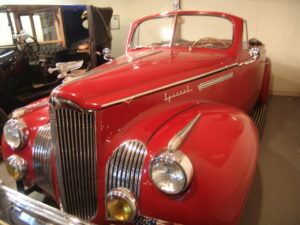 Series 54, Six Cylinder, Argentina Carnival Red, Regal Tourer. 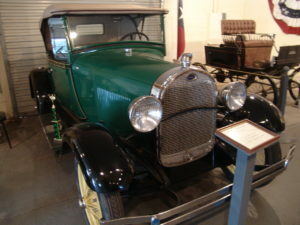 Terrill Antique Car Museum. De Leon, Texas. I don’t believe I was born in the wrong time period—I figure God put me right where He wants me—but I must admit to feeling an affinity for things from the past. In my opinion, nearly everything—cars, clothing, furniture, even houses—were prettier in the old days. Small appliances were practically a work of art. 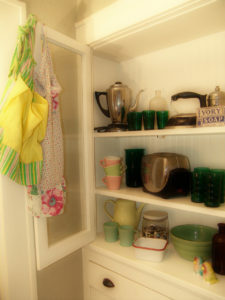 The picture here is from own kitchen. Looking at these things each day makes me happy…it’s that simple. It’s just a hodge-podge of old things, some from before I was born, but to me they’re beautiful. I especially love the aprons. They remind me of my mother. Mama was/is one of the greatest cooks that I know (something I didn’t “inherit”) and I grew up with the best meals, made from scratch, that a person could want or need. I didn’t always appreciate it at the time, and was often envious of the kids in the neighborhood who got to eat “out” (I didn’t even know what that meant at first), but I realize now how special those meals—and my Mama’s dedication to her family—truly were. Mama cooked a lot for us kids (seven of us), and prayed a lot. I’m truly grateful for both. I’ve been doing research for a book I’m writing that’s set in the 1880s. I specifically needed to know more about jails, prisoners, sheriffs, marshals, outlaws, etc. I’m always happy to have my head in a book, or eyes fixated on a microfilm reader—I truly enjoy doing research for historical projects—but I also love going to museums. We’ve got some wonderful museums in Central Texas, many within spitting distance of my home (not that I’ve ever tried), and I hope to tell you about every one of them someday soon. But I visited a new one recently that was such a delightful surprise—the Old Jail Museum in Palo Pinto, Texas (Palo Pinto County seat)—that I wanted to share a little bit about it with you now. 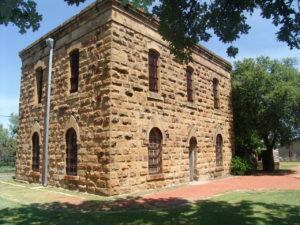 The jail, built in 1880, is a two-story sandstone structure that served Palo Pinto County until 1941. 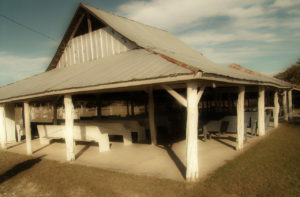 It was restored and converted to a museum in the late 1960s. Originally, the first floor was home to the jailer and his family, while the second floor housed prisoners. 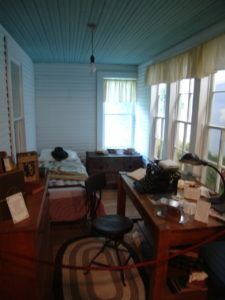 Now both floors are filled with artifacts and exhibits, including medical instruments and equipment. 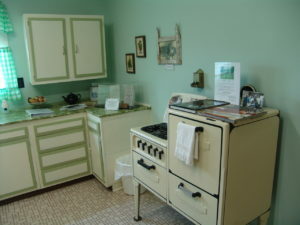 There are also early day household items, including an antique refrigerator and cook stove. Other highlights include the old telephone switchboard, and the 1850s printing press that was used to produce the Palo Pinto County Star for many years. There’s also a display tribute to Palo Pinto law enforcement. There are several displays devoted to ranching/cattle, since cattle kings Charles Goodnight and Oliver Loving both figured prominently in Palo Pinto’s beginnings. 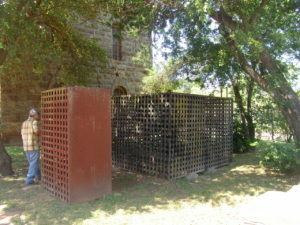 Although all the cells are gone from inside the building, there are still two (large metal cages basically) in the yard of the museum. The smaller of the two cells was built (in the county’s early days) so that it would fit on a wagon. That way Palo Pinto officials could transport prisoners to Huntsville as the need arose. According to a museum staff member, it often took as long as two weeks to make that long, perilous journey. I can’t even imagine. One of the more unusual displays on the second floor is a hangman’s noose suspended over a trapdoor. It was added to the jail in 1906, but was never used. There were executions, but for some reason they took place on scaffolding erected at the nearby courthouse. 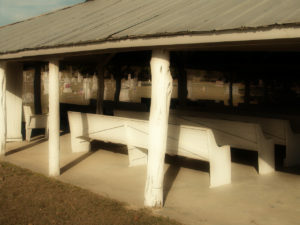 The museum yard features several log cabins and lots of primitive ranching and farming equipment. 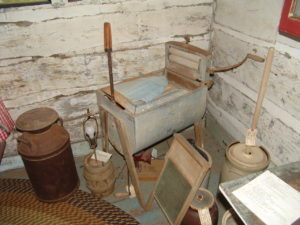 Inside the cabins there are displays devoted to early day pioneer life—including lanterns, cookware, bedding, furniture, churns, rub boards and a wringer washing machine with a hand-activated agitator. There’s also a blacksmith shop, complete with tools, and a carriage house with a restored buggy. I’ve just hit a few of the highlights here, there are so many more things to see at this museum. One word of advice though, there doesn’t appear to be a lot of dining options in Palo Pinto. I saw one convenience store/grill type place (across from the courthouse) but no restaurants. It’s only 11 miles to Mineral Wells, though, and you can find lots to eat there. 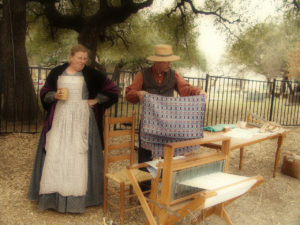 The Old Jail Museum Complex is located at 5th and Elm streets in Palo Pinto, and is open every Thursday, Friday and Saturday (10-3) beginning the first weekend of March to the second weekend of December. Thanks for traveling along with me.